The RVIPF newest recruits assemble in front the HLSCC’s Marine Centre with Chief Instructor Sergeant Westmore Jeffers (far left); Sergeant Beverly James (far right) and Physical Trainer Joseph Valrose (front centre). Tuesday, March 24– Thirteen of the Force’s newest officers are now in uniform as they enter their fourth week of a demanding, six-month training programme. 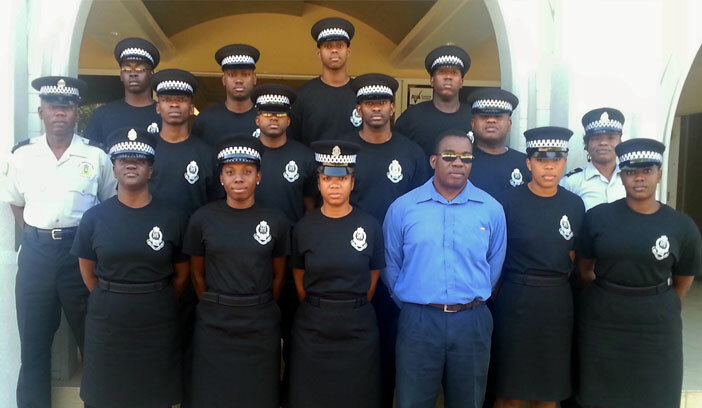 The Royal Virgin Islands Police Force is conducting its first on-island recruit training for the eight males and five females that makes up this class. 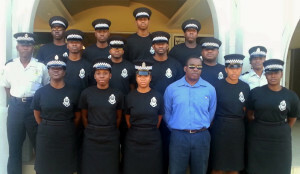 Formerly, officers entering the RVIPF were sent to the Regional Police Training School in Barbados for that six months training. Chief Instructor Sergeant Westmore Jeffers says the training is rigorous and challenging beginning with early morning physical exercise, a full day of instruction and late night studies in preparation for assignments the following day. “The police training curriculum covers the foundation for policing in both theory and practice. The new recruits must dig deep and be resourceful in order to progress through the stages of the curriculum,” he said. In-class instruction is being delivered by Sergeant Jeffers and Sergeant Beverly James while specialist training is provided by other officers of the Force. Mr. Joseph Valrose is lead instructor in the physical training programme. The new recruits are occupying the newly refurbished barracks at the Road Town Police Station for the duration of the six-month training programme. Lectures on all aspects of law enforcement are conducted at the Marine Centre at H. Lavity Stoutt Community College.